Recently, my father-in-law had a fall, went through a hip replacement, and is recovering well at home. Queenie, one of the professional caregivers from the government “Home First” program attending to his recovery, told me about the problems she is experiencing with some of her other clients. Some do not remember their appointments with her and do not answer the door or phone when she arrives at their home. She needs to know that in advance or she risks wasting a trip on a no-show situation. At the same time, she is overwhelmed by some of her demanding clients wanting her to help with tasks that are not normally considered her responsibilities. Yet, she would try to meet their needs within the allotted time, going beyond her regular routine and making her job very stressful at times. The government program needs workers like Queenie who is passionate about her job and experienced in helping recovering seniors. A better program will require better care for the caregivers so they don’t get burnt out, a well-understood phenomenon that leads to poor performance and high turnover rates in this industry. CareRinger is a call robot designed to provide telephone reassurance and reminder support for the caregivers and their loved ones. It is equally applicable for professionals like Queenie to provide relief. 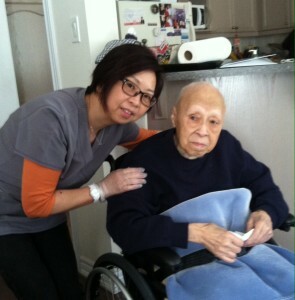 A CareRinger call on the day of Queenie’s “Home First” service can serve to remind her clients of their appointment. If her client is capable of responding to this unobtrusive phone call, Queenie will know that they are there waiting for her. Otherwise, CareRinger will call or send a message to her to let her know that her client is away from his/her phone. When this happens, Queenie or someone in the program should check on the client to make sure they are aware of the appointment before dispatching Queenie to her next job with this client. Who knows, if the client is having a real problem, the CareRinger call and the follow-up calls as a result could help discover an accident, minimize suffering or even save lives. Based on a patent issued by the US Patent Office in 2015, the CareRinger technology has gone through several years of rigorous testing and user trials in the United States in different settings. The technology has proven to work reliably and offers value that is unique in many ways when compared to life-alert and other services for the aging population. Among them, CareRinger is proactive, not intrusive and works with different kinds of phones, including plain old telephones our seniors are familiar with. It’s not an out-dated technology! Don’t forget that our telephone network remains to be the one with the most coverage, capable of serving even rural and underserved areas not accessible to other alternatives. CareRinger is affordable. It is designed to support the mission “Telephone Reassurance for All” as opposed to technologies that are not easily learned and that are beyond the reach of the majority with financial challenges. With the changing landscape in our aging population, many will choose “aging in place” as opposed to moving to a retirement home. Research indicates that most seniors would prefer staying in their own home that they are so used to and for as long as possible while enjoying life. This is possible with the support from their community, friends and family. CareRinger will make it easier for everyone involved.